I am pleased to invite you to the upcoming Finance 2.0 Summit: January 26th & 27th in New York City. When we started planning the Finance 2.0 Summit in New York a few months ago, who could have guessed where our industry would go. I believe that the market turmoil of the last few weeks means that the Summit is perfectly scheduled for January 26-27 at the Harvard Club. The faculty features the financial industry’s superstars in social media and is focused on providing real, actionable tools and strategies that you can use to reach out to your customers in a more effective, meaningful way. I look forward to seeing you in New York City! Get a discount at Finance 2.0. 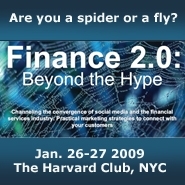 In January, I’ll be speaking at Finance 2.0. I just found out that I can offer my readers a discount. Ten of my readers can get a 15% discount off the regular registration fee of $2,095.00. I was also offered two discounts of 35% each. Normally I would keep the bigger discounts for colleagues at Vancity, but I want to offer them here to readers of my blog. So if you want a discount, contact me at william |at| azaroff |dot| com and I’ll shoot you the info.